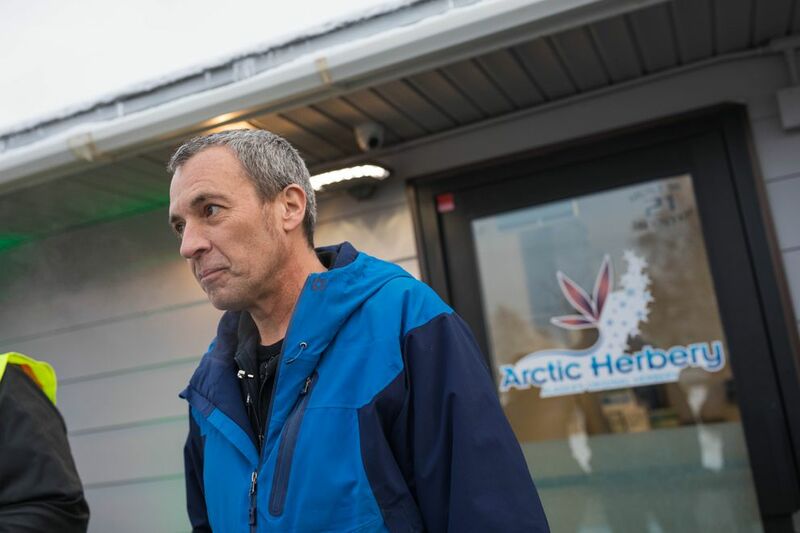 The first customer at Arctic Herbery, which on Thursday became the first store in Anchorage to sell consumable marijuana, wasn't planning to smoke the cannabis she bought. Anna Ercoli got to the shop around 8 a.m, she said. She was given a ticket to hold her place at the front of the line, so she didn't have to wait for hours in the cold. And at noon, she bought 2.5 grams of the strain Afghani Kush, surrounded by a swarm of reporters in a quick transaction at the small shop on Arctic Boulevard. Ercoli planned to go home and turn the cannabis into a medicinal cream that she could use for knee pain. She wasn't shy about sharing her past experience using marijuana salves. "I'm 80, so whatever goes, goes, I don't care," Ercoli laughed. The cream — first given to her by a friend — has helped her pain, she said, but smoking marijuana makes her sick. 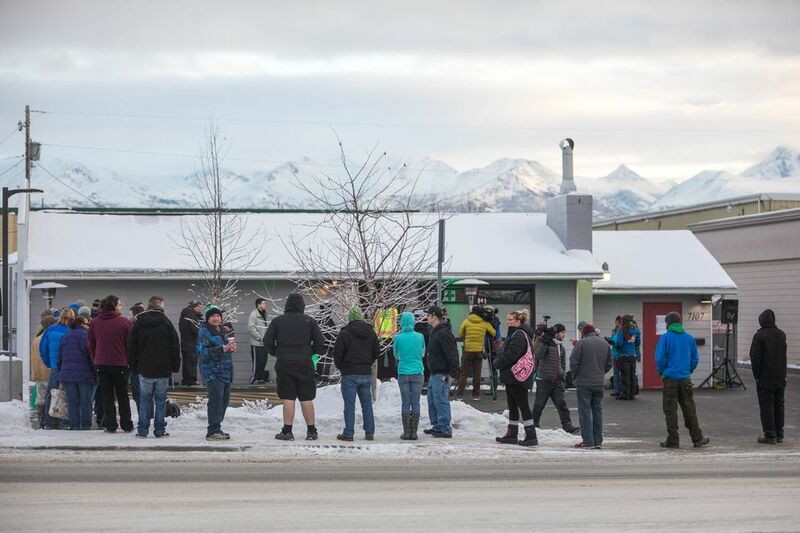 Arctic Herbery's opening Thursday afternoon marked the beginning of marijuana retail sales in Alaska's largest city, about six weeks after the state's first store opened in Valdez. Last week, Arctic Herbery opened with only "clones" — immature marijuana plants — in stock. By 11:40 a.m., about 50 people waited in a line that curved around the perimeter of the property. 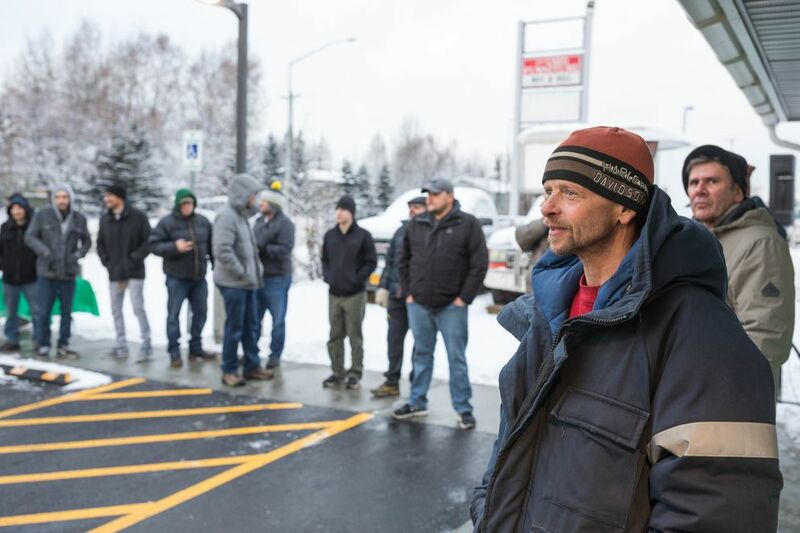 Bryant Thorp, owner of Arctic Herbery, had set up a shuttle service, as he has only a handful of parking spots at the store, and the shuttle brought a steady flow of customers to the shop. The second customer in line, Michael Strand, did plan to smoke the marijuana he bought. "I'm just down here to see what the hubbub is," Strand said, when asked what brought him out for the opening day. "I like to be first in line at a lot of different events … I do that for concerts all the time." "I feel great, this is a good day," Thorp told a group of reporters in the minutes before opening. One person asked about the difficulties leading up to his opening, which was delayed after a media report that he had given away free samples led to a state violation and a temporary stop to his city license. "Do you see this?" Thorp said, motioning to the line. "This is the future. We're not going anywhere." Inside, Thorp was selling three different kinds of cannabis — Blueberry, Afghani Kush, and Pineapple Chunk strains — from Black Rapids, a grower in the Interior community of North Pole. Customers could buy a package of 2.5 grams for $50, or pre-rolled joints for $15, not including a 5 percent city sales tax. Thorp limited customers to one package and two pre-rolled joints to avoid running out of product. More marijuana shops are planning to open in Anchorage in the coming weeks and months. 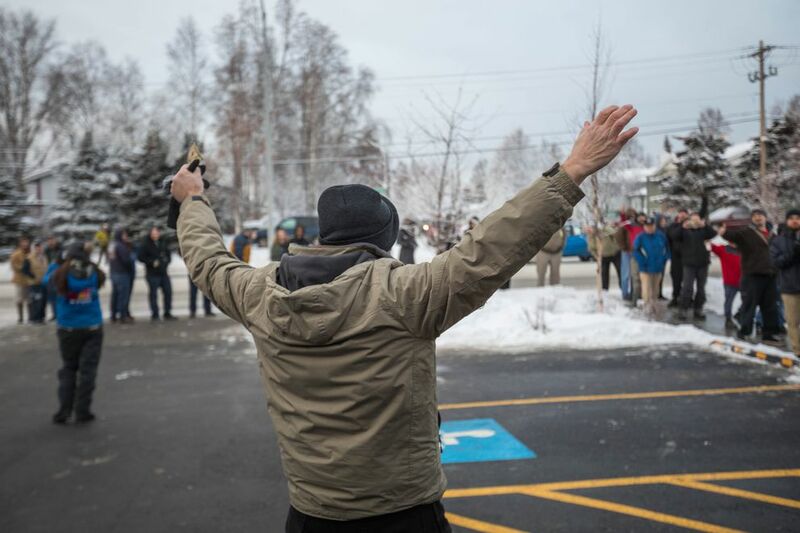 A second marijuana shop, Alaska Fireweed, plans to open on Saturday. "I feel free!" J.D. Stinson yelled as he left Arctic Herbery with a bag in hand. He bought Afghani Kush. "I never thought I would see this day," Stinson said. "I never understood the criminalization of marijuana. It always offended me," Stinson said. "In 1983, because I had 6 plants at home, I suddenly became a criminal." Stinson said he hadn't smoked in more than 3 years, and wasn't planning to go home and light up. "I'll save it for when I can relax … I've waited decades to do this, I can wait a few more days."